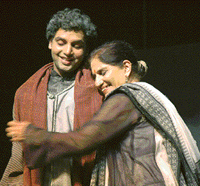 A scene from Waqt ne kiya kya hasin sitam, a play on the life of Kaifi Azmi. Kaifi Azmi was essentially a poet of the world. Much ahead of his times, he could step into the future and talk of a world that had lost the capacity to foresee and forestall. Tormented by sectarianism, Kaifi did everything in his power to arrest the trend. Most of all, he wrote with a heart that cared and wrote not of rosy fictions of life but of its painful realities. The relevance of Kaifi has thus naturally inspired creative artistes to capture his philosophy in their chosen mediums of expression. Rani Balbir Kaur, a former chairperson of the Department of Indian Theatre, Panjab University, Chandigarh who had the privilege of knowing Kaifi, has made the very first among these attempts. Using the poet’s family as her primary source for research, Rani Balbir has structured a sensitive production that offers a first hand introduction of Kaifi Azmi. Entitled Waqt ne kiya kya hasin sitam (incidentally Kaifi’s favourite song from Kagaz ke Phool), the play derives from Kaifi’s writings, Shaukat Azmi’s yet-to-be published autobiography Yaad ki Rahguzar, Shabana Azmi’s articles and a poem Ajeeb aadmi tha that Javed Akhtar specially wrote for the play. Also woven into the script are landmark events from Kaifi’s life – his romantic encounter with Shaukat; his love for the village, his outpourings against fundamentalism. All these episodes offer insights into the life of poet who used to say, "When you work for a change, keep space for despair as you may not see your efforts to fruition in your lifetime…but the struggle must abide…endure and go on…"
For Rani Balbir, putting together the source material was a great challenge. She explains, "Building on the storyline was tough. Another problem was Kaifi’s no nonsense nature. Unlike most poets who are conscious of their social identity, Kaifi was reticent. My challenge was to put words and images to a man of few words." It all started when Shaukat Azmi read out few passages from her book Mere Shauhar mere Dost to Rani Balbir at her Mumbai home. Says Rani, "I felt a pressing urge to tell Kaifi’s tale to the world. I was glad to have the support of Shaukat and Shabana. Shabana sent me a world of literature on her father. She even offered to act if I hired professional actors. But I chose to groom amateurs." The first show was staged in a hurry, mainly because Shabana was eager to see how it had evolved. The second show, presented on December 24 last year, was a huge success. It had among the audience Javed Akhtar, Shabana Azmi, Baba Azmi and Tanvi Azmi. Smitten by the production, Baba Azmi expressed a desire to make a film on the script. Rani Balbir is now writing that script. She wishes to call the film "A soul by nature pitched too high…"
"Here the reference is to Kaifi who despite being physically paralysed showed great courage of action," says Rani who staged the last show for Pakistani guests at Chandigarh’s Tagore Theatre on March 11. But it could not impress like the earlier ones because many of the trained actors did not turn up. Now as the show rests in Rani Balbir’s storehouse, her concern is to raise a team of committed actors who would not let her down on March 29 when the production will again be staged on special request from Shabana Azmi. This one will be held exclusively for the Communist Party of India.